Weather kept the Offshore boats at the dock, looks like they will have a much better chance of getting out tomorrow. 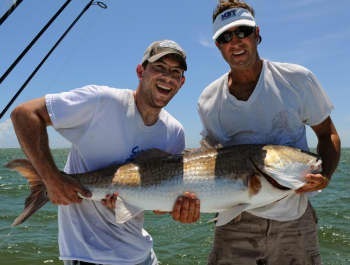 A few Inshore boats ventured out and had great Red Drum fishing both morning and afternoon despite getting rained on. Weather today was overcast with periods of rainy squalls. A few boats offshore today they reported good Wahoo and some Blackfin Tuna. Predator released 2 Blue Marlins and a Sailfish. Good Times released 2 Sailfish. Inshore boats fished between the rain and got keeper Red Drum, Spanish Mackerel and Bluefish and limits of Clams. We are starting our makeup list for the week and already have a few people interested in going. 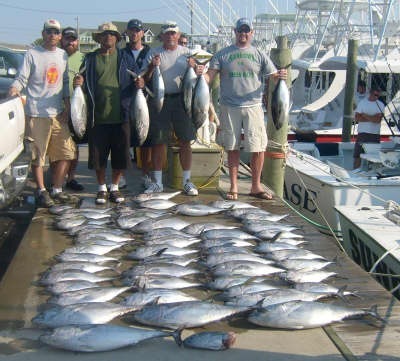 It only takes 5 to make a trip so come by and claim your spot for and all day Gulfstream fishing trip for $280. Good Times: Greg Barkmeyer of Phoenixville, PA released a Sailfish. Ryan Wallace of Washington, DC released a Sailfish. Predator: Justin Daybert of Pine Grove, PA released a Blue Marlin. Torrey Garver of Mifflintown, PA released a Sailfish. Colten Garver of Mifflintown, PA released a Blue Marlin. Native Son: Gary Hayes of Spring, TX caught a 44lb Wahoo. Inshore boats had catches of both Gray and Speckled Trout, keeper size and release size Red Drum, also a few Sea Mullet. 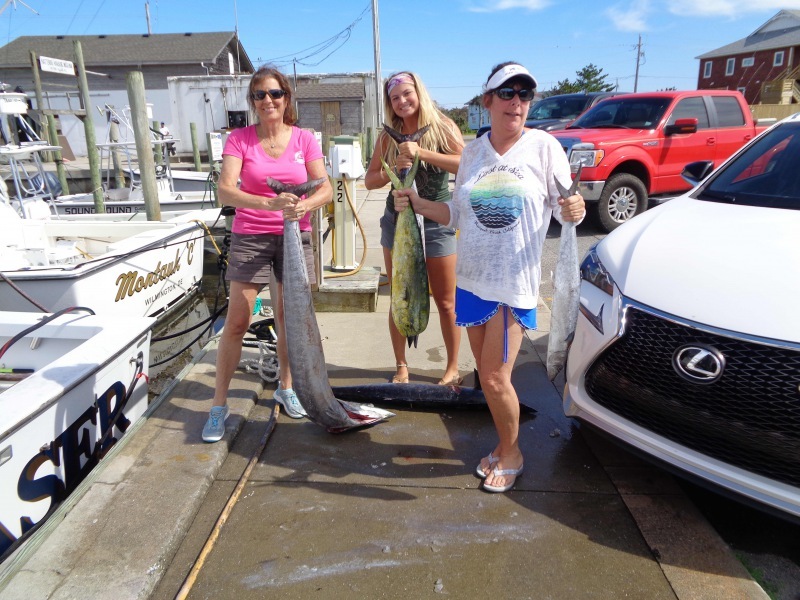 Round the inlet and along the beach catches of Spanish Mackerel and Bluefish rounded out the day. Winds blew from the SW creating a big swell offshore, so no boats fished today. Inshore anglers got on the Speckled Trout again this morning. Looking forward to better weather tomorrow, so check back or come to the dock between 4-5 p.m. to watch the catch come in! Hatteras Island was reopened to visitors at noon today! We are very grateful to CHEC and everyone who came to help and restore power. Thanks to everyone for their patience during the last week! We are open and ready to take you fishing inshore, near shore, or offshore. The fish are awaiting your arrival! Several boats fished inshore and enjoyed a rainy morning catching Speckled Trout. The Wahoo bite was excellent offshore today and anglers returned with limits. 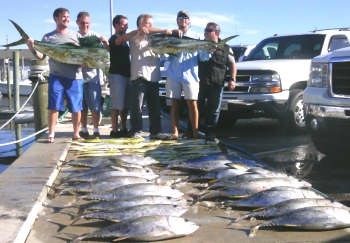 A few Dolphin and Blackfin Tuna were caught. Bottom fish included Tilefish and Grouper. Good Times boated a Sailfish. 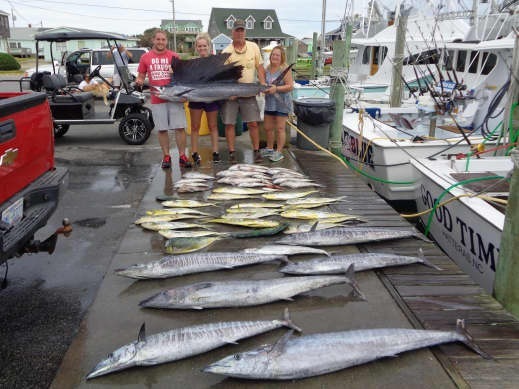 Joshua Blevins of Smithfield, NC: 70" Sailfish on Good Times. William Clark of Stuart, VA: 12 lb. Gray Tilefish on Release. It has been a rather quiet day in Hatteras. We may have regular power restored in 1 or 2 days and as soon as that is accomplished hopefully we'll be ready to welcome visitors back on the island. Thanks to everyone for their patience! 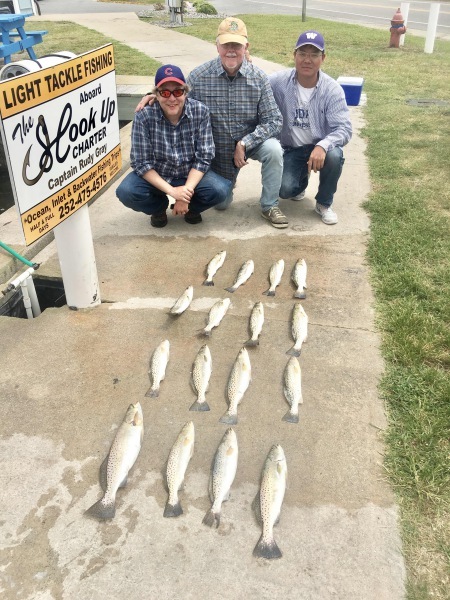 Inshore charters reported good Speckled Trout catches and a good Puppy Drum bite. The Wahoo bite was good offshore. 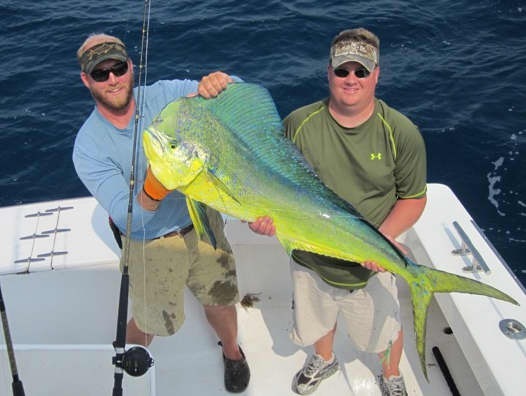 A few Dolphin were caught and some nice catches of Triggerfish and Vermillion Snapper were brought in. 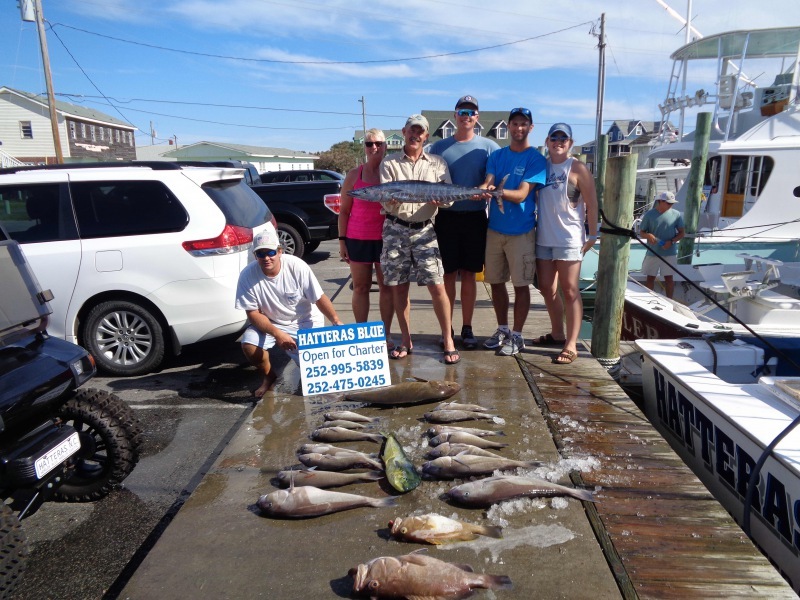 Give us a call at 800-676-4939 to book a fishing excursion for your upcoming vacation - it's a great way to make memories with friends and/or family! Finally some boats are out fishing! Offshore boats were doing well with Wahoo and a few Dolphin. 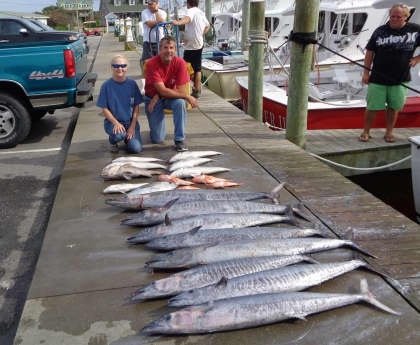 Inshore boats were catching Spanish Mackerel and Bluefish. Weather was cool with low humidity. We are still under non-resident travel restrictions however "Dare County Emergency Management Director Drew Pearson- if you have a charter that is staying north of the Oregon Inlet Bridge while the mandatory evacuation order is in place, you can email Drew with their names and the date of their charter and they will try to work them through. [email protected]" We hope to have full power restored soon and welcome visitors and anglers back. We wish the CHEC speed and safety in their repair efforts, they have certainly gone above and beyond to get us this far. If you are lucky enough to be on the island Harbor Deli is open from 11am-3pm for lunch. Predator: Holly Rietscha of Downingtown, PA released a Barracuda. Inshore anglers kept busy this morning catching Speckled Trout, Bluefish, and Spanish Mackerel. 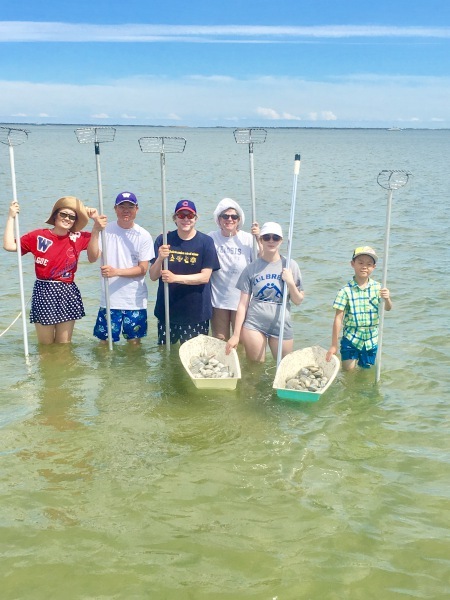 Some groups spent their time clamming and dug their limit from the waters of the Pamlico Sound. Captains are beginning to offer shelling excursions for those not interested in fishing or clamming. Sight seeing tours are offered as well. This afternoon brought about good Red Drum fishing. 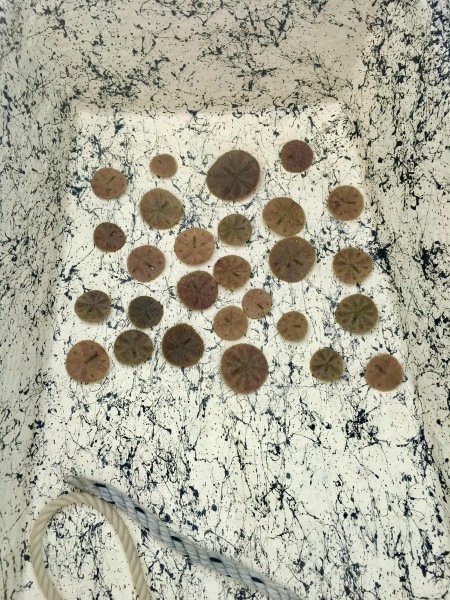 The Sand Dollars in the first picture came from the Sound! There are so many opportunities to explore and discover new finds! 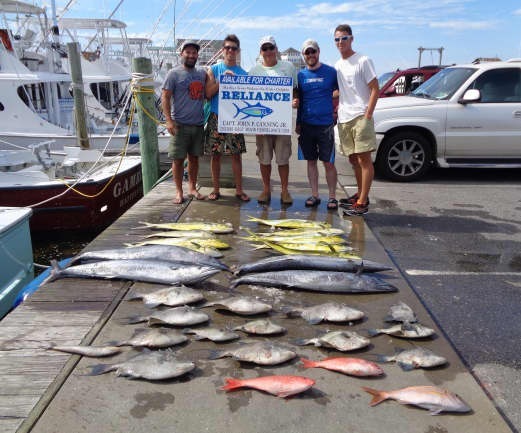 Offshore anglers experienced slow fishing conditions today. The Dolphin and Blackfin Tuna bites were scattered. Wahoo fishing was good. Big Eye released a Sailfish.Sundown released two Sailfish. Happy Birthday, Rebecca!! 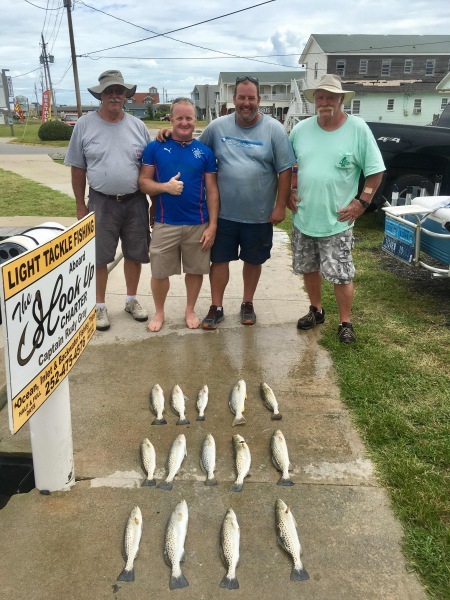 There were deep water and shallow water bottom fish caught by several parties. 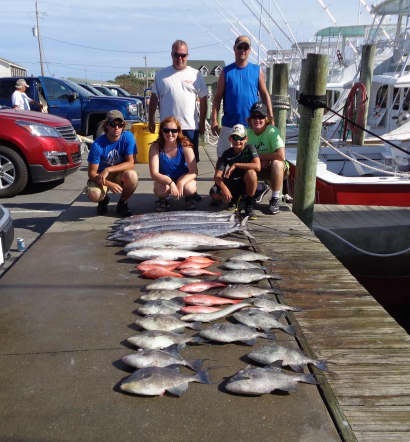 Don't let July get away without a wonderful fishing adventure out of Hatteras Harbor Marina! James Battle of Richmond, VA: 21 lb. Grouper on Good Times. Owen Johnson of Mechanicsville, VA: 11 lb. Gray Tilefish on Good Times. Saxton Marek of Kitty Hawk, NC: 4 48" Red Drum releases on Fingeance. Kevin Donovan of Los Angeles, CA: 3 49" Red Drum releases on Fingeance. Taylor Lounsbery of Kitty Hawk, NC: 52" Red Drum release on Fingeance. Andrew Bernd of Bethlehem, PA: Sailfish release on Big Eye. Bridget Evans of Wadsworth, OH: 42 lb. Wahoo on Hatteras Fever II. Clay Gumphrey of Frederick, MD: 52" Sailfish release on Sundown. Thomas Dodson of Union Bridge, MD: 42 lb. Wahoo on Sundown. Stephen Peach of Walkersville, MD: 65" Sailfish release on Sundown. Kevin Erickson of Windber, PA: 47" Red Drum release on Adventure. Shadoe Smith of Windber, PA: 45" Red Drum release on Adventure. Michael Spinos of Windber, PA: 46" Red Drum release on Adventure. Kyle Smith Jr. of Windber, PA: 48 " Red Drum release on Adventure. Kyle Smith of Windber, PA: 40" Red Drum release on Adventure. We had a few Offshore boats out on this breezy day. Skies were overcast for most of the afternoon giving a little cool from the heat. Boats were catching a few Blackfin Tuna and Wahoo as well as Grouper and Triggerfish. 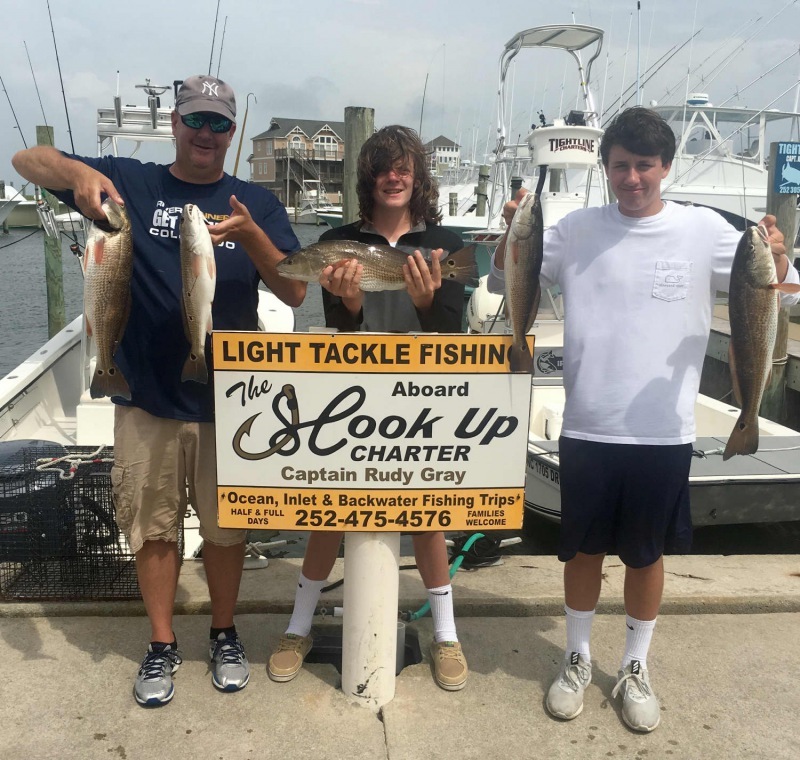 Inshore boats caught some Red Drum and limits of Clams. Trips are booking up fast for the week, don't miss your spot. 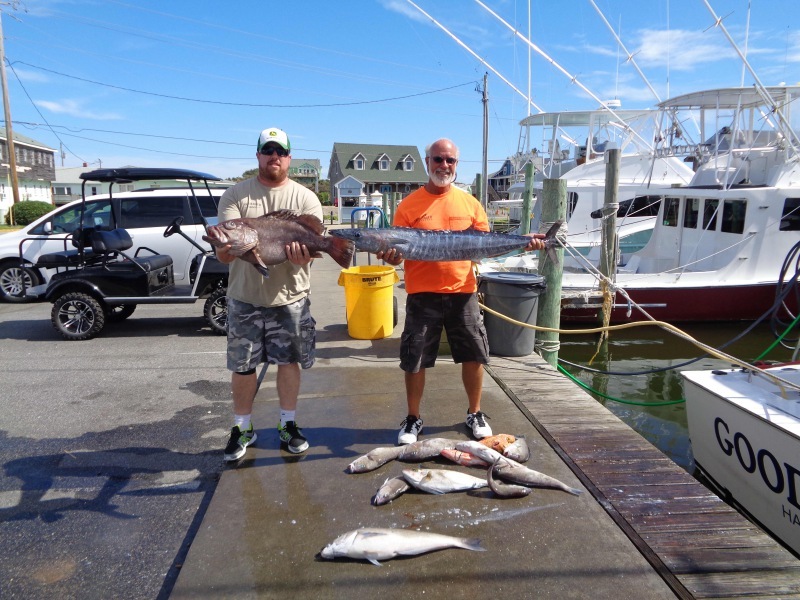 Release: Scott Borer of Chesapeake, VA caught a 43lb Wahoo. Jordan Johnston of Toledo, OH caught a 23lb Grouper. Adventure: Pete Baragona of Long Beach TSP, NJ released 2 Red Drum. Glen Corrigan of Wantage, NJ released a Red Drum.